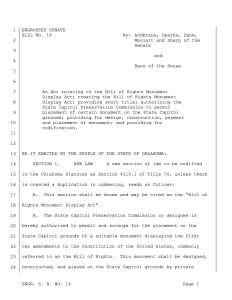 SB 14, which authorizes a privately funded monument of the Bill of Rights at the Oklahoma Capitol, has unanimously passed the Oklahoma Senate. The vote of 46-0. Co-sponsored by Senator Patrick Anderson (R-Enid) and Senator John Sparks (D-Norman), SB 14 is the first bill to pass the Oklahoma Senate in the 2016 session. It now moves on the House. The bill is the result of outreach by MyBillofRights.org going back to 2014. Previous attempts to get legislative authorization were delayed by a moratorium on all new monuments at the Oklahoma Capitol in the wake of the legal fight over the 10 Commandments monument, erected in 2012. That monument was removed in October of 2015 in accordance with the State Supreme Court’s ruling, opening the way for our authorizing resolution to proceed. To read and download the full text of SB14, click on the image below.